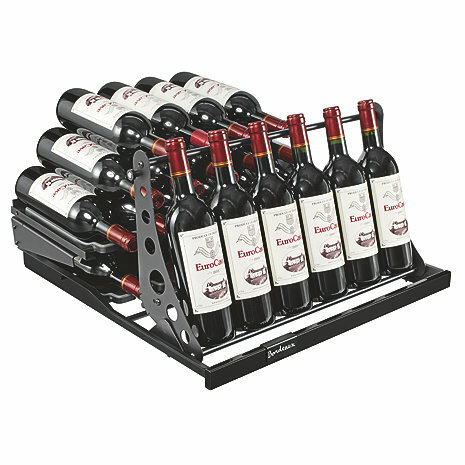 The articulated shelf allows elegant inclined presentation of bottles which are placed in an articulated support. When the shelf is pulled out, the support facilitates access to the bottles stored. How many shelves need to be removed for this display shelf? Four shelves will need to be removed. Added this to my Revelation. Still has room for additional storage behind, so you don't lose much. Very nice look, especially with the internal lights on. For spacing of larger cab bottles (like the rest of the cabinet) only plan on 5 bottles showing - otherwise it looks really tight. Just received our presentation shelf for our EuroCave Revelation, easy to assemble and looks GREAT! What a wonderful way to enhance the beauty of our already amazing Revelation. It takes up the space of 3 shelves but there is ample extra storage behind the front vertical presentation area. Wish I could post a pic. So happy I decided on getting this add on item! Love it! Product is great. Would be better if it would have come with 2 additional shelves verses the one. Would help with additional storage. The down side I ordered at the same time as I ordered my Eurocave Revaluation l. I received the wrong item. Customer service was great. I Was able to send it back and then the display shelf was on back order. In a few weeks I received yet again the wrong item. Customer service was great and this time I finally received the display shelf. It works great. No survice recovery. Very sad.